The economy may be growing, but if you're unemployed, you may feel otherwise. One's perspective is everything. Some work to live; others live to work. Then there are those who do neither, choosing, instead, to drop out of the rat race. When Tim Johnston lost his gig at a New England nonprofit, he immediately started a new job -- finding his next position, which is a job unto itself. 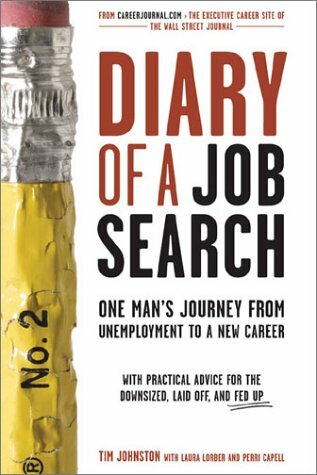 Through a fortunate series of circumstances, he began chronicling his progress and setbacks for the employment website CareerJournal.com. As he posted his articles online, Johnston was joined by 300,000 other people who were ''between opportunities,'' and they formed a virtual community as they reacted and responded to each piece. They also wrote of their own travails and shared advice, cautions and leads. ''The evolution of the Internet as a recruiting and hiring channel (by one estimate, there are 40,000 job sites) has made establishing human contact with potential employers far more difficult. Charm and presence, which I've always perceived to be among my strong assets, are suddenly difficult to apply. Now when I make a cold call to an employer, I hit a more solid wall. The larger the company, the harder it is to get even a name of a contact. ''Up to this point, I'm fine. A small joke or a little warmth and I should be set.
' 'Well, I'm very interested in learning more about how your company does [fill in the blank],' I say with a smile. If this book consisted solely of reprints of Johnston's observations and ruminations, it would probably suffice. But along with his columns, there are plenty of sidebars by co-authors Lorber and Capell offering advice, warnings, how-to's, checklists and more -- all practical, sensitive, intelligent, actionable and up-to-date. The resulting package is a worthy addition to the astute job-hunter's bag of tricks. For those who feel like rodents running within a wheel, author Ernie Zelinski has a book's worth of sympathy. Why work? Time is more valuable than money, and materialism is a trap. Clearly, this approach is not for everyone. There is the matter of survival and the standards one uses to measure success, as well as other values (and those of one's significant others). With numerous testimonies from readers of Zelinski's other books (and earlier editions of this one) whose lives were changed irrevocably by the experience, much of what the author preaches is obvious, though counterintuitive to those of us with hard-wired work ethics. But for the burned-out, the disgruntled, the idealistic and the seekers of increased leisure time, he may provide an impetus (or rationalization) for jumping off the labor treadmill.